BLADDERWRACK BENEFITS - HOW IT WILL CHANGE YOUR LIFE!! Bladderwrack is a species of brown algae or sea weeds that has enormous health benefits; it has been used for centuries especially by coastal communities and now gaining popularity among professional scientists and in modern medications too, because of its amazing medicinal properties. It grows on a few specific places such as the coasts of the North Sea, the Western Baltic Sea, the Atlantic and the Pacific Oceans. This seaweed has forked and brownish-green branches with gas-filled bladders. One can identify them quite comfortably, as it is often found in huge numbers, especially on the eastern coast of North America. Before utilizing bladderwrack benefits, local communities gather the entire living plant from the rocks and dry it under the sunlight in order to turn it into a crude powder. These days, professional medicinal companies dry it by the artificial heat too in order to retain its natural benefits and keep them in perfect condition; they collect it during early and middle summer as they are the perfect months for collection and the seaweeds are not fully matured too. Since, once they are thrown up on the shore by the sea, or during the winter season, they are not suitable for medicinal purposes; they often lose their nutrients and vitamins. 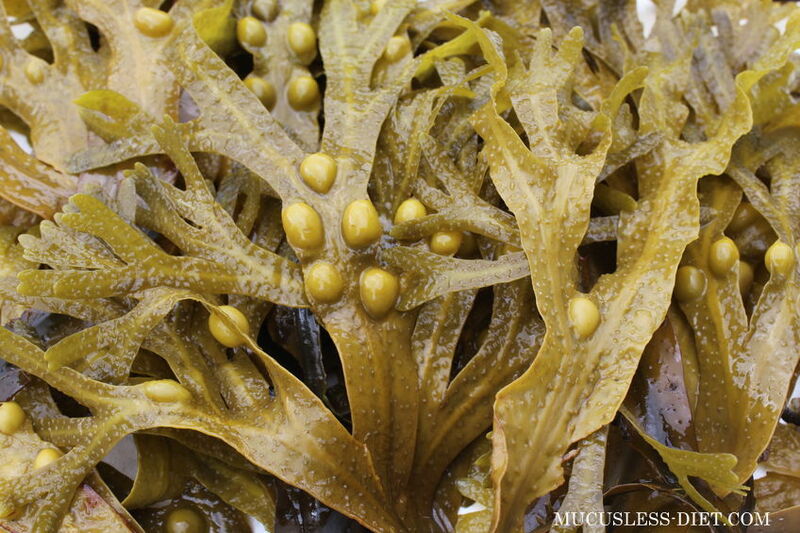 Now, let’s take a closer look and reveal some exceptional bladderwrack benefits and show exactly how it facilitates you in different health conditions for natural, long-term health. Bladderwrack is part of Dr. Sebi's Bromide Mix. You use 50% bladderwrack and 50% seamoss. Read how to make Bromide mix at home for pennies on the dollar. Are you struggling with skin and aging issues? Well, this herbal remedy reverses the signs of aging and relieves severely irritated skin conditions. Furthermore, it improves skin tone, texture and elasticity as well. Experts believe that it is one of the greatest sources of natural antioxidants which helps in your skin appearance and makes you feel and appear younger for longer. If you want to nurture and soften your skin, reduce redness, acne, and eruptions, have firmer skin tone and texture, and improve elasticity, you can 100% rely on the bladderwrack benefits. It’s becoming increasingly popular ingredient in anti aging and skin care products; some people indeed use it as a home remedy too. When it comes to thyroid hormones and thyroid dysfunction, bladderwrack has shown beneficial effects in the treatment as it is a rich source of iodine which is an essential component of thyroid hormones, and it is an important modulator for our thyroid gland too and ensures that our hormonal activities are under control. Human body does not have the ability to produce its own iodine. Therefore, we rely on foods that are the good source of iodine or we take prescription medications for thyroid dysfunction. Dr. Pina LoGuidice ND and Co-Medical Director of Inner Source Health, recommends to the viewers of The Dr. OZ Show that this seaweed is an excellent source of iodine and can cure the cases of low thyroid gland, also known as hypothyroidism, in a very effective way. There are perhaps thousands of diet products that promise near-effortless weight loss and they are freely available from the pharmacists and supermarkets. But, when it comes to concrete results, they are not good enough, and most of them push a person into disillusionment because of their long term side effects. However, luckily, simple bladderwrack recipes (like tea) can melt extra pounds off. It has the natural power to adjust cholesterol and dissolve those fatty build ups in the body and in the blood vessels that compel you to struggle with obesity. Moreover, it has been proven over and over again that if adjusting your diet or exercising more are not helping you to lose weight, you probably have an underactive thyroid gland, which requires iodine intake for the treatment. And, this herb naturally contains iodine that treats thyroid gland and has a normalizing effect on it. The next bladderwrack benefit is the ‘Vision Health’. The elevated amounts of beta-carotene make it an ideal remedy for those who want to enhance their vision and keep their eyes healthy; beta-carotene is an antioxidant that neutralizes free radicals in the eyes and cornea, helps slow down macular degeneration, and inhibits the development of cataracts. For that reason, these days, it is also known as the ‘eye nutrient of the future’. Chinese scientists have done back to back studies on it and found that the nutrients that come from this herb provide better support for vision problems – especially due to computer eye syndrome or hand-held devices. Though, there are plenty of ongoing researches on this heavenly gift, but it has been established that light-absorbing mechanism of this plant offers those nutrients and pain-fighting properties that support vision grandly. There are numerous, incomparable kinds of fiber in it, but the most important factor for digestive health and digestion enhancing is Alginic Acid. Unlike other artificial supplements or herbs, the best thing about bladderwrack is that you do not have to use it for a long term for digestive health. Just a few days use can relieve constipation and diarrhea. It promotes the smooth gastric process that is immensely efficient in terms of nutrient uptake. Other than that, the different types of fiber also facilitate in relieving excess flatulence, bloating, and more severe situations like digestive ulcer and colon cancer. The additional components make it a great medicine for heart burn too. In order to relive constipation or improve digestive health, all you need is 1 teaspoon of powdered bladderwrack, three times each day, with at least 8oz of water each time. The bladderwrack benefits are still sparking the feelings of wonder among scientists, since this iodine and mineral-rich seaweed is becoming a treasure for treating new and different severe conditions as well. Today, physicians and scientists are curing different health issues like cancer, heart health, joint pain, thrombosis, hormones, and etc. through it too. They believe that this herb requires a lot more in-depth and professional research as it shows a promising sign for treating modern health issues like anxiety and stress and create interesting, dramatic, and positive impact on them too. Since, there are lots of other good factors in it including Vitamin A, Vitamin B-complex, C, E, G, S, K, calcium, sodium, magnesium, potassium, iron, silicon, sulfur, selenium, phosphorus, and zinc that prove that bladderwrack benefits are a complete blessing and not in the limits of our imagination.